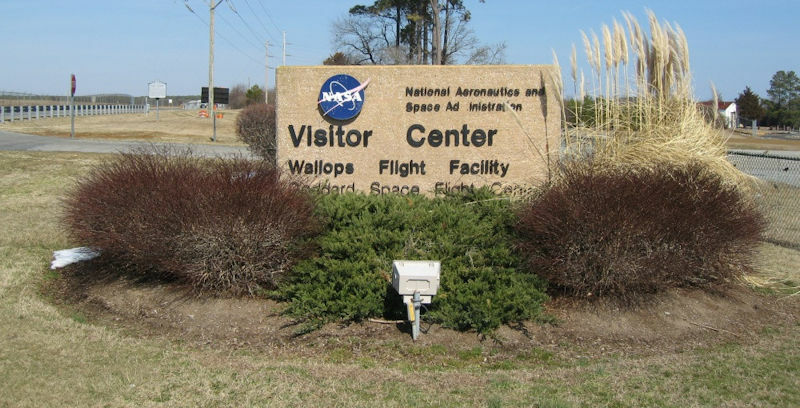 The NASA Wallops Visitor Center is located approximately 4 miles from the launch pads with a clear view of every launch from ground to sky. Parking is available on a first come, first served basis. The Visitor Center launch viewing area consists of two bleachers and an open field. During a launch the Visitor Center exhibit hall is open to explore and Range Control Center system checks play over the PA system. Plan to arrive 3 or more hours prior to a large scale mission launch window. Bleacher seating does fill up quickly but you can bring a folding or camp chair to set-up in the launch viewing area. NO pets are permitted at the Visitor Center (including in vehicles) with the exception of service animals. NO coolers are permitted on the Visitor Center grounds. Coolers ARE permitted in vehicles parked on the Visitor Center grounds. NO tents are permitted on the Visitor Center grounds. NO large bags are permitted on the Visitor Center grounds. A standard school backpack or smaller is permitted. NO RV’s are permitted to park at the Visitor Center on the day of the launch. NO oversized vehicles will be permitted to park at the Visitor Center on the day of the launch. An oversized vehicle is any type of vehicle that does not fit in a standard parking lot space. Mariners Point is located at the southern tip of Chincoteague Island, near Curtis Merritt Harbor. It is the site of the Chincoteague Island Waterman’s Memorial. Visitors to this location should park at the south end of Curtis Merritt Harbor and walk up the hill (follow the signs). Beware that parking may be limited during launch events. This location offers direct and unobstructed views of Wallops Island rocket launches. Maddox Blvd – from the Museum of Chincoteague Island to the bridge to Assateague Island – also offers unobstructed views of rocket launches from Wallops Island. Note that you will need to park on the side of road or in McDonald’s parking lot. 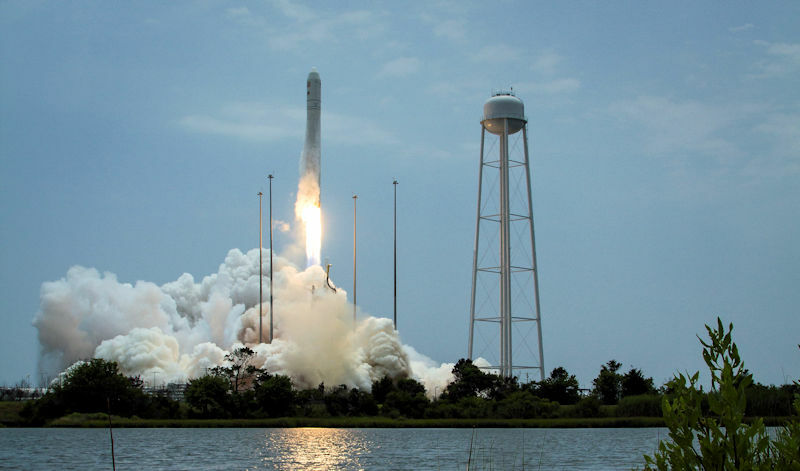 Please note that the Chincoteague National Wildlife Refuge and Assateague Island National Seashore (Virginia District) is typically closed during large scale rocket launches. Please check the Chincoteague National Wildlife Refuge website for closure information. If you can’t make it here for a launch, but you live along the East Coast (especially the mid-Atlantic region), there is a good chance a large scale rocket launch from Wallops Island will be visible in your area. 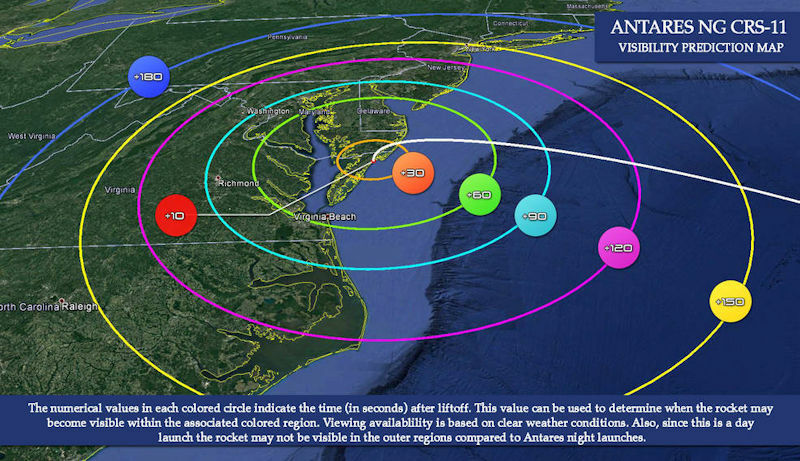 Launch Visibility Maps are typically posted to the NASA Wallops Flight Facility website (https://www.nasa.gov/centers/wallops/home) and WFF Mission Status Center Webpage (https://sites.wff.nasa.gov/wmsc/). Major launches from Wallops Flight Facility are streamed live on the Wallops Ustream Channel (http://www.ustream.tv/channel/nasa-tv-wallops) and NASA TV (http://www.nasa.gov/multimedia/nasatv/). Be sure to check the status of launches on a regular basis because launch dates and times are subject to change or cancelation in advance or at the last minute. A variety of unforeseen circumstances can cause a launch to be postponed.